Now - over a quarter of a century later - and thanks to the arrival of the multi-channel Super Audio CD, there is finally a system available which permits these precious recordings to be released in the quality they deserved back then. Digitally re-mastered on 2 SACDs, this release also features a complete libretto both in French and English. 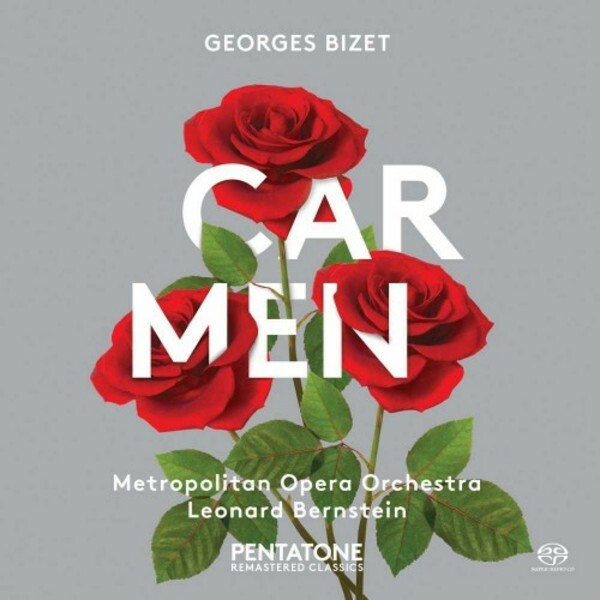 With delight, Pentatone re-releases Georges Bizet�s opera Carmen, which remains one of the world�s most frequently performed operas from his repertoire. In one of its reviews in September 1982, the New York Times declared �a strong vote for Bernstein�s much-debated 1973 recording of Bizet�s �Carmen,� with the Metropolitan Opera Orchestra and the great Marilyn Horne in the title role. Bernstein�s daringly slow tempos, though criticized by some, are revelatory. Ms Horne�s �Habanera� is all the more seductive for its reined-in pacing and sultry phrasing�. Many claim that it is by far the best recording of Carmen. Leonard Bernstein�s rendition is as sharp as Marilyn Horne and James McCracken�s performances are stunning.